Offering focused personal injury representation, our team at TSR Injury Law serves people living in Minneapolis, Minnesota, and throughout the Twin Cities area. We are passionate about helping those who suffer injuries through no fault of their own to achieve financial justice. To best serve our clients, our law firm offers free initial consultations, and we accept credit cards. Our law firm regularly handles cases involving car, trucking, motorcycle, pedestrian, jet ski and boating accidents; animal bites; construction accidents; dangerous or defective drugs and medical devices; products liability; premises liability; nursing home abuse; and wrongful death. We have seen first-hand the long-term effects from spinal cord, brain and burn injuries. Tailoring our approach based on clients' specific circumstances, needs and goals, we strive to recover the maximum compensation on their behalf for their injury-associated losses. When it comes to establishing fault for injury-causing accidents, our team knows the importance of preserving evidence. We investigate clients' claims thoroughly, helping them gather witness statements, law enforcement reports and medical records. Since our law firm's founding in 1997, our attorneys have seen the pains insurance companies will take in order to avoid paying for the negligence of their clients. As experienced negotiators and litigators, we are prepared to challenge these companies to hold them accountable. Suffering an injury due to the negligent or careless actions of others can leave people struggling with a number of challenges. 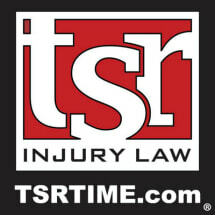 Our team at TSR Injury Law provides the compassionate and respectful assistance our clients need during this difficult time, so they can focus on making speedy and full recoveries.